And after slicing. 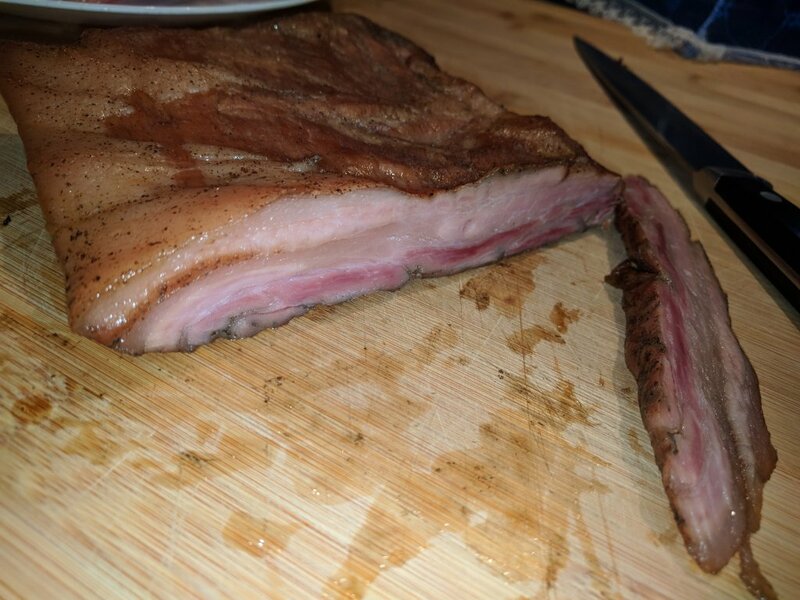 I cooked up a few slices, still a little salty but really nice bacon. I think the meat was a little on the light side after trimming. Welcome to the making bacon club! Looks like you hit a home run first time up. I bet it smells really good when you fried some up. Hard not to eat the whole batch right off the smoker! It will improve greatly in flavor and in the salt being more uniform in the meat after maturing in the fridge for a couple or a few days. I have gone to wrapping mine (uncut other than the immediate cooks treat slices) in the plain brown uncoated butcher paper while maturing it in the fridge. It will also firm up some and be easier to slice after that aging and drying period. Smoked meats like bacon and sausages need that rest time after smoking. 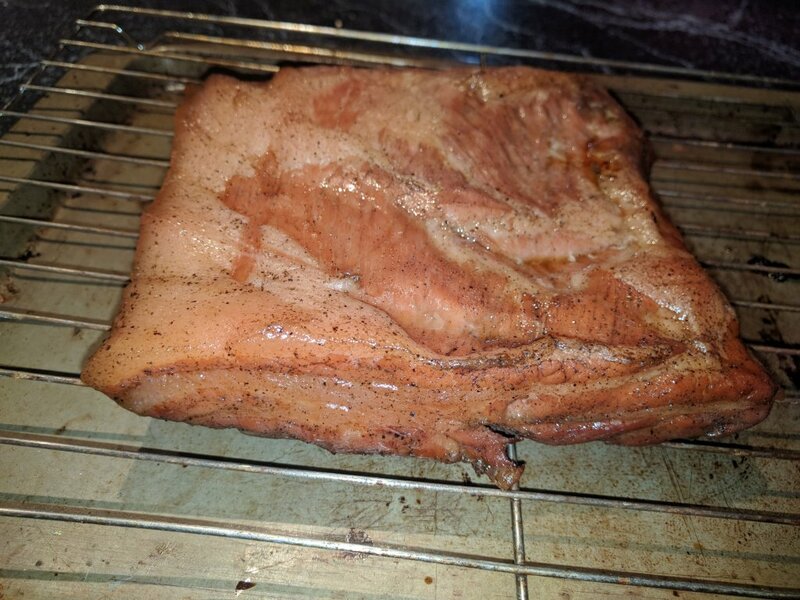 Did you smoke it to a "cooked" internal temperature of 145 to 150 degree (F) internal or leave it semi-cooked? Oh, now I see in your tag phrases you did a "cold smoke". I have been smoking mine to the "cooked" internal temperature at a smoker temp of not more than 170 degrees (F) to avoid fat rendering. Then when pan fried it is just outstanding. Once you make your own bacon you will be hooked on making bacon. I bet you are already planning your next batch. 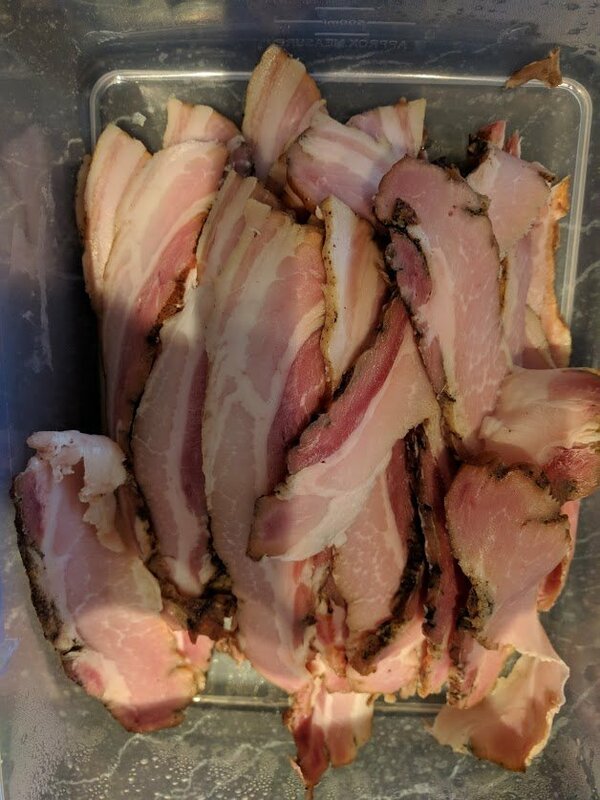 I just finished smoking 20 lbs of belly bacon yesterday and today in two 10 lb batches after 14 days in an immersion cure with different cure flavors and different wood smoke flavors. I smoked it to an internal temp of 150F, I don't have a cold smoker (yet). I may start another batch this weekend and take your advice of letting it sit a couple of days after smoking. You are right about being hooked, this smells and tastes so good especially when in the pan.